Christmas Ornaments Made in USA - Red, White and Blue Patriotic Crystal Glass Ornament - A Christmas Ornament Co.
Santa's favorite ornament: this beautiful red, white and blue ornamental ball is hand blown glass from artisans who have been in the craft for generations. It can be given as a "friendship ball," can be hung outside year-round anywhere (it is EXTREMELY thick glass) and in fact can be hung or placed just about any place you can imagine as a reminder of what makes this country great. Also makes a great gift for anyone, anytime. 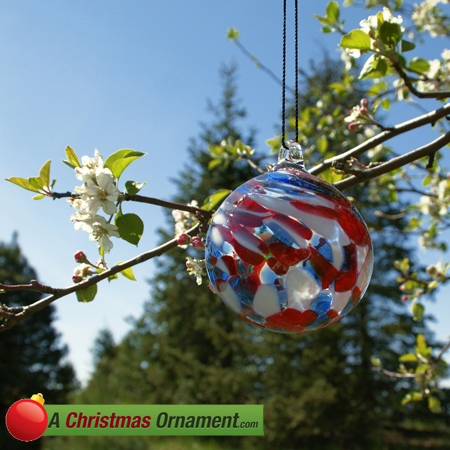 This ornament is made with pride in the U.S.A and measures a whopping 4" across. All ornaments are insured and delivered to you by the United States Postal Service. USPS is committed to doing "absolutely, positively" whatever it takes to deliver the ornaments to you. Delivery Time - 5 - 10 Business days. Our Return Policy - AChristmasOrnament.com will pay the return shipping cost if the return is a result of our error. Please note that we are unable to exchange items. All sales are final. A minimum of 20 ornaments needs to be ordered to qualify for this wholesale price. A minimum of 100 ornaments needs to be ordered to qualify for this wholesale price. A minimum of 200 ornaments needs to be ordered to qualify for this wholesale price.